Iran’s Supreme Leader maintained his latest diplomatic offensive on Monday, using the visit of the South Korean President to appeal for closer ties with Asia. Regular contacts and exchanges would secure interests of both countries; agreements and deals should be planned in a way to avoid the negative effects of foreign tariff systems and sanctions. More importantly, Iran-South Korea relations should not be under the impact of the US and its interventions to undermine bilateral trade. On Monday, the Supreme Leader told leaders of Palestine’s Islamic Jihad that the US has started a war against “the Islamic front”. Later in the day, he said Iran would “show off its power” in the Persian Gulf to counter “bullying powers” like the Americans. 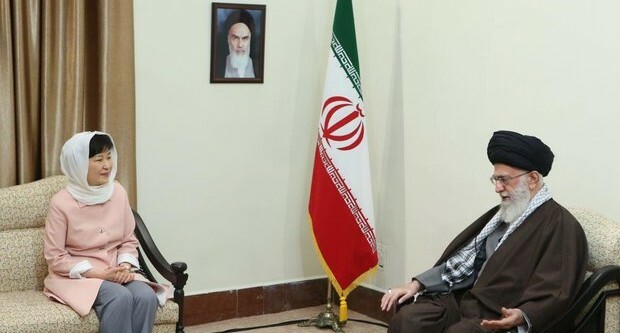 However, Khamenei’s appeal in the meeting with Park was more about economics — citing “the negative effects of foreign tariff systems and sanctions” — than a military showdown. Our priorities in coop. with S. Korea are not only trade & business; deals should be signed to address Iran’s need on infrastructures, too. Despite January’s implementation of the July 2015 nuclear deal, Iran is facing challenges to revive an economy crippled by years of sanctions, mismanagement, and corruption. Tehran is struggling to revive production, with the International Monetary Fund recently projecting a flat growth rate for 2016. The fall in global oil prices has hit revenues, with the Government yet to present a budget for 2016/17. Asia’s importance as a market has grown for Iran during the period of US and European sanctions. Its four major oil customers are all from the continent: China, Japan, India, and South Korea. On Monday, President Rouhani and Park signed agreements covering sectors such as energy, banking, and infrastructure. Rouhani said trade between the two countries will triple from $6 billion to $18 billion per year. Oil Minister Bijan Namdar Zanganeh asserted on Sunday that exports of oil to Seoul have quadrupled to 400,000 barrels per day since January. Parliament has passed a law allowing the Government to grant citizenship to the families of foreigners killed while fighting for Iran, in conflicts such as the Syrian civil war and the battle against the Islamic State in Iraq. “Members of the Parliament authorized the government to grant Iranian citizenship to the wife, children and parents of foreign martyrs who died on a mission… during the Iran-Iraq war [1980-1988] and afterwards,” State news agency IRNA announced on Monday. Citizenship must be awarded within a year of the request. Thousands of Afghan emigrants have found under the command of Iran’s Revolutionary Guards, alongside Iraqi and Pakistani militia, in the Syrian conflict. The Afghans have been given incentives such as money and the promise of permanent residency and have been pressured with threats of deportation and harassment of their families. A BBC documentary last month profiled the experiences of the men, described as “cannon fodder” — often put into battle with little training — to face fire from rebels, the jihadists of Jabhat al-Nusra, or the Islamic State. The mother of journalist Afarin Chitsaz, who was recently given a 10-year sentence, will make a judicial complaint to protest the beating of her daughter in prison. They blindfolded my daughter and beat her with a water bottle to get a confession out of her. The abuse was not carried out by the main interrogator, who was very respectful towards her. But in any case, we will pursue this matter with the case judge. Chitsaz was arrested in November amid a crackdown by the Revolutionary Guards on the media and activists. A week ago, she was sentenced with journalists Ehsan Mazandarani and Ehsan (Saman) Safarzaei and marketing manager Davoud Assadi. For six months Afarin was held in a solitary 2-meter by 1.75-meter cell. She was allowed fresh air only twice a day for half an hour in the ward’s courtyard surrounded by walls. In the entire six months she wore the same clothes in which she was arrested. They wouldn’t allow us to give her fresh clothes. Now she’s in a general ward, which is much better than her situation before, but she’s suffering from psychological shock, kidney pain and severe heart palpitations. She has gone to the prison infirmary a few times but they only gave her painkillers.